My 1. 5 year old baby has low neutrophils and high lymphocytes. Why? iCliniq › Ask a doctor online › Answers › Hematology › High Lymphocyte Count › My 1. 5 year old baby has low neutrophils and high lymphocytes. Why? Q. My 1. 5 year old baby has low neutrophils and high lymphocytes. Why? My 1.5 year old boy has low neutrophils (17%) and high lymphocytes (74%). He has normal hemoglobin and total WBC. We did this blood test one week after vaccinations. There is no actual complaint, and we did the blood test to check if there is iron deficiency. I have attached the blood report for your reference. Please check. • Is there something serious about lymphocytes count that is high? • We went for a regular check up and reports suggest leukemia. Can you help? As per report provided, the lymphocyte count is slightly high. 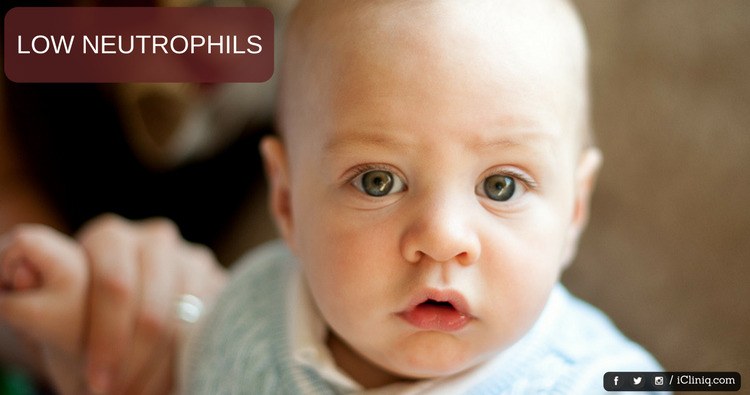 In the case of a child with age 1 to 3, the lymphocyte count can be up to 70%. Lymphocytosis is considered in the child of 1.5 years when the absolute lymphocyte count is more than 9000. Here, it is not more than 9000 in your case. Hence, clinical correlation should be done as temporary viral infection can lead lymphocytosis. So, acknowledge with any significant clinical history about your child for further comment. You can consult a pediatrician for clinical examination with keeping all this in mind. Take care. The CBC report shows high lymphocytes. What could be the reason?